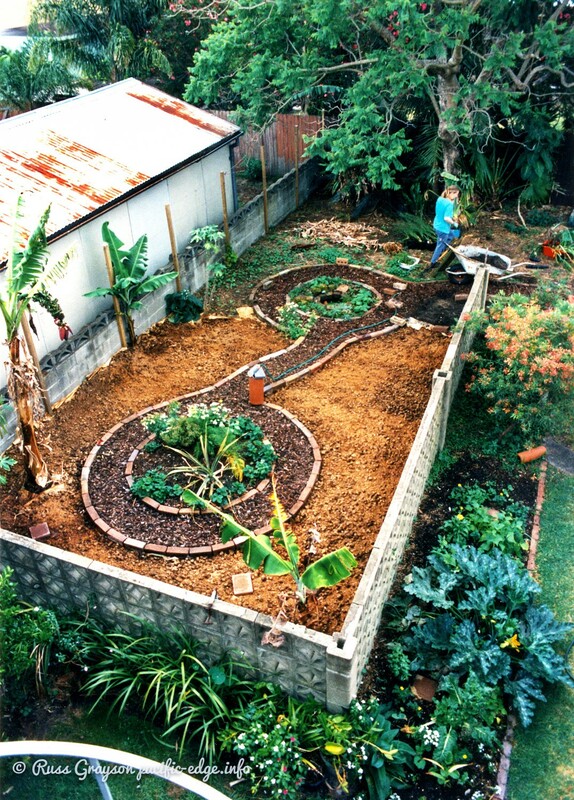 Originally published in 1999, this is the story of how a permaculture educator went about designing and building a suburban garden in Sydney. The story might have relevance to others attempting this type of project. Originally published on pacific-edge.info by Russ Grayson, 1999. OCCUPYING SANDY SOIL adjacent to Botany Bay, a fruit and vegetable garden has been designed and planted to feed a household of three. “We’re not trying to grow all our own food”, says Fiona Campbell, designer and householder, ” …just produce some of our staples as well as a few less-common vegetables and herbs for cooking. 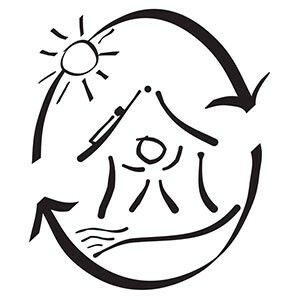 Fiona and her partner teach an urban Permaculture Design Course through their consultancy, PacificEdge. They also taught permaculture in the TAFE horticulture course, were landcare educators at Calmsley Hill City Farm and have been involved in food security and village farming projects in the Solomon Islands. 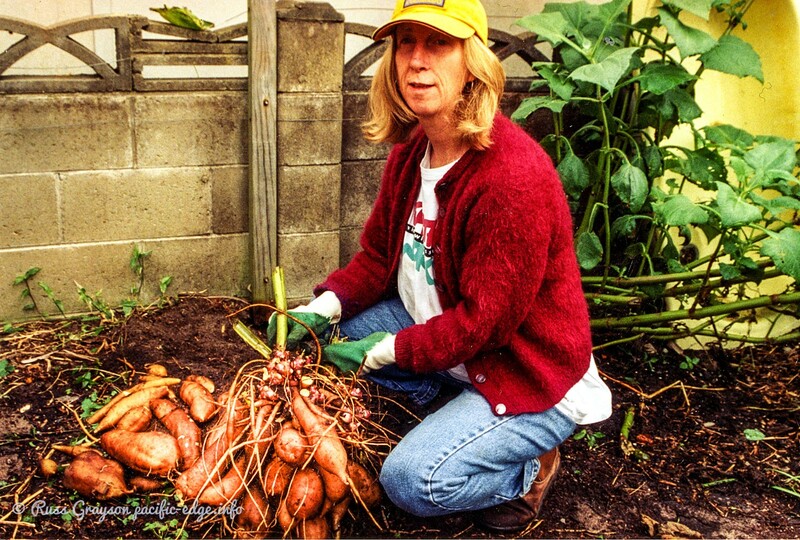 “The woman over the back — she’s from an Italian family — is the only other person around here with a vegetable garden. There’s all this land in backyards going to waste, just growing lawn. The only useful trees in gardens along the street, directly useful to people that is, is the unused lemon tree next door, an unharvested Magenta Lillypilly (Syzygium paniculatum) a couple houses down and my mandarin tree. “One of the reasons for redesigning the garden was to make suburban living more sustainable in a food and in an environmental sense, so we do not have to buy food that is imported great distances and so we can make effective use of our kitchen and garden wastes to make compost”. When Fiona set out to design the food garden she quickly discovered the site’s limiting factors. These were a nutrient-poor, sandy soil, a large Jacaranda tree at the northern end of the garden and a neighbour’s tall oleanders that cast long shadows over the garden, making up to two-thirds of the site unusable in winter. “These — existing vegetation and shading by neighbours’ trees and buildings — are common limitations in gardens in urban areas”, Fiona said. She later removed the Jacaranda but could do little about the oleanders. “As other urban gardeners have learned, some things you have to live with”. Another limitation was a concrete block fence along two sides of the site. This could not be removed. Fiona’s earlier work in civil engineering and landscape design were to come in handy. Out came the measuring tape, the calculator and drawing instruments and off Fiona went to measure-up the site and draw a base plan. That done, she carried out a site analysis to identify wind directions through the seasons, the paths followed by sunlight and shade and the characteristics of the soil. It was important to make the paths wide enough for a wheelbarrow but to maximise the growing-area-to-path ratio. “The goal was to design a vegetable garden that would be intensively managed so as to maximise yield. “Access was very important. I needed to get a wheelbarrow into the garden, so I’ve had to think carefully about paths. It was important to make the paths wide enough for a wheelbarrow but to maximise the growing-area-to-path ratio. Some gardens you see have paths wider than they need be and, so, waste valuable growing space. Maximising growing space is important in small urban gardens. 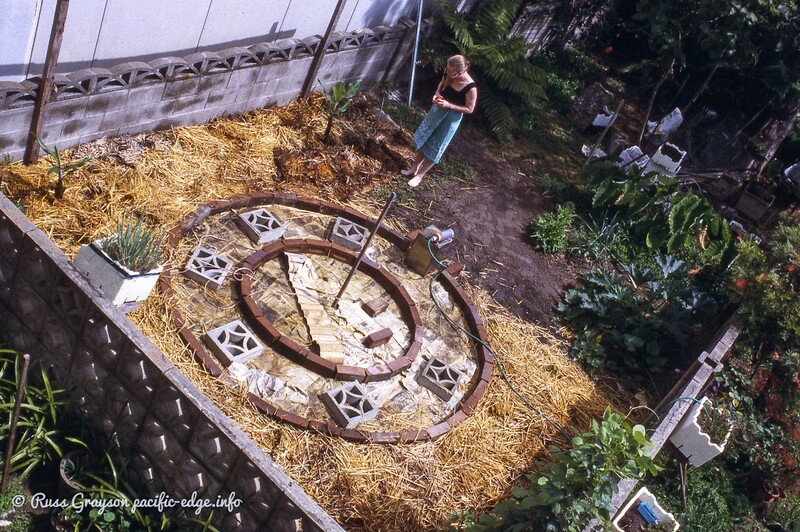 “There was already a compost system by the side fence so I decided to keep it there. The local lawn maintenance man gives me his lawn clippings and leaf sweepings so I can compost them. I wanted some small fruit trees — pawpaw, banana, tamarillo — down the back and an area for growing culinary herbs. The garden design has to pack a lot into a small space”. 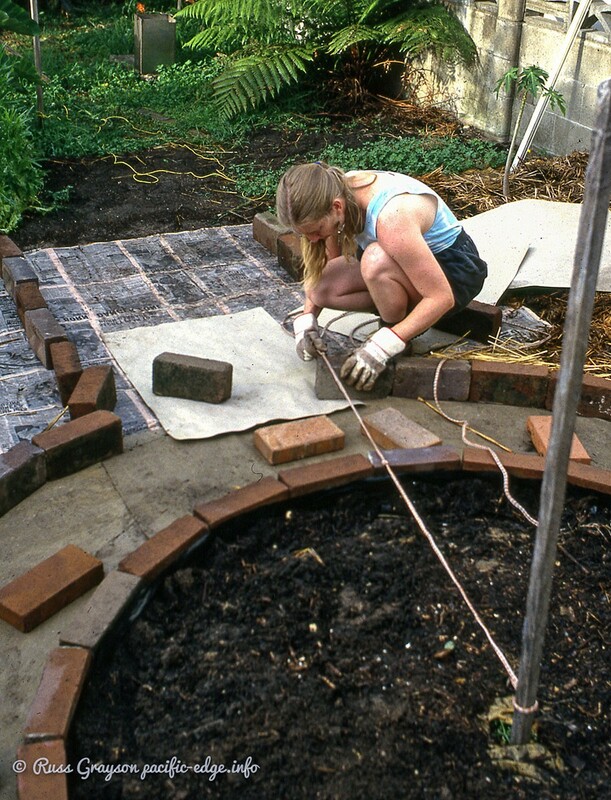 Fiona considered a range of garden bed and path designs before settling on two concentric circles joined by a curved path. Drawn-up on paper the design looked promising, howevet Fiona wanted to get some idea of how the design sat on the ground and of the look and scale of the design. Measuring the design out on site, she drove a stake into the soil at the centres of what would become the circular garden beds. A length of rope was knotted at the circumference of the circular bed and, further along, at the width of the surrounding circular path. Moving the rope around the stake, Fiona described the circumference of the circles by marking them out with organic fertiliser. This traced out the shapes of the gardens and the path. “Doing this is a useful way to visualise the garden design on the ground. It tells us how the design could be improved before we start construction. It’s a way of getting direct feedback about the likelihood of our design working”. The garden appears as two circular beds surrounded by a 600mm wide path, with the garden areas either side of the path composted, mulched and planted to vegetables. Banana and pawpaw occupy the outer edges of the garden as they require less access for maintenance. A curving path links the beds. A circular water garden was dug in the centre of one of the circular beds and planted to edible water crops such as watercress, water chestnut and water dropwort. A circular herb garden was made in the central section of the other circular bed. The design decided and assessed, the next stage was construction. 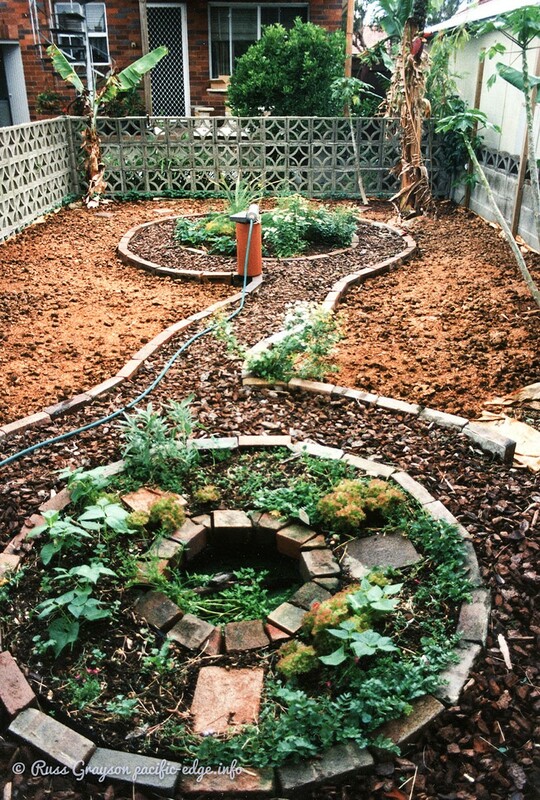 The garden with one circular bed built and partially mulched. Newspaper was laid on the soil surface as a weed barrier in garden bed and path. First job was to clear the site and prepare the soil. The entire area was mowed and the weeds left to break down in the soil. “You cannot do this with weeds that are carrying dried seeds”, explained Fiona. “Because those seeds are likely become the next generation of weeds”. “Next, I loosened the soil by forking it to the depth of the garden fork. I didn’t turn it, just penetrated it and rocked the fork back and forth to loosen the soil. This helps water and fertiliser penetrate the soil profile, aerates the soil and allows plant roots to grow unimpeded. I added organic fertiliser on top of the soil before forking — I used dolomite, blood and bone, dynamic lifter and compost as the sandy soil is extremely poor in nutrients. “Now, I planted the perennials such as banana, pawpaw, New Zealand spinach (Tetragonia tetragoniodes, an indigenous wild food of Sydney’s sandstone soils) and rhubarb. It is important that this be done before laying the newspaper weed barrier and mulching”. Care was taken to precisely position the bricks forming the garden edges so as to minimise weed growth between them. The bricks were placed on top of a weed barrier of newspaper. The string line attached to the centre pole marked out the garden path’s circular shape. Garden paths were edged with reused bricks. The pond planted to edible water crops is seen in the background. The paths were edged with old bricks and the garden beds infilled with compost placed on overlapped sheets of newspaper seven to ten pages thick. The compost acts as a late-release fertiliser because it will not become available until the newspaper weed barrier degrades. The soil amendments forked into the soil before the newspaper was laid become a quick release fertiliser. 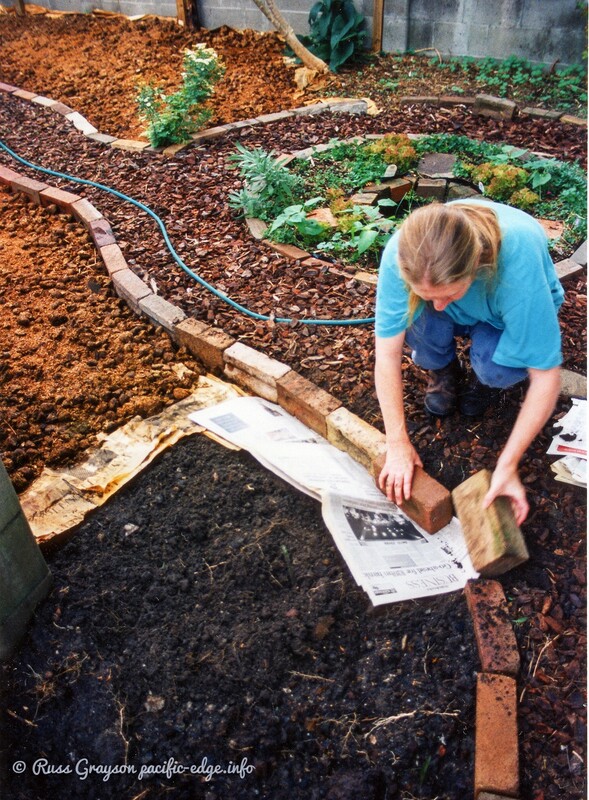 Over the entire garden, a layer of mulch was added and seedlings planted through the mulch and newspaper layers. As an experiment in part of the garden, Fiona tried a different means of soil preparation. “I wanted to try the biointensive method developed by John Jaevons. I started by spreading a couple centimetres of compost on top of the soil. Then I modified his double-dig method by using single-dig then forking the soil layer below the dig. This opens the soil and incorporates the compost spread on the surface. 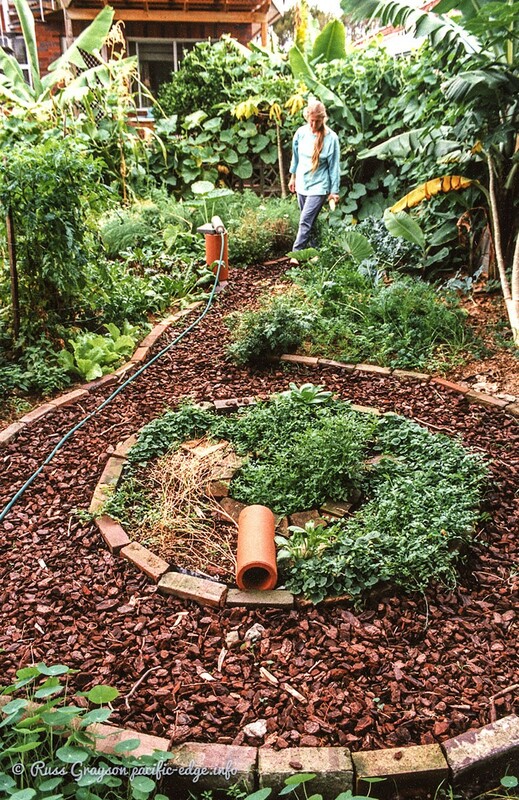 “The biointensive approach incorporates nutrients into the soil faster than the no-dig method used elsewhere in the garden. Some people don’t like it because digging, they say, disturbs the soil life. I’ve found it to be no problem at all — the soil biota quickly recolonises soils that have been dug, especially when they are enriched with compost. Vegetables seed and seedlings were planted into compost placed in holes scooped into the mulch. “I make a cut through the underlying newspaper to assist root growth, however some people don’t do that”, Fiona said. “I plant large seeds directly into the soil and I propagate small seeds into seedlings to plant out”. Spinach, rainbow chard, malabar spinach, upland cress, tomato, chives, capsicum, garlic chives, beans, corn and basil were among the first crops planted in the main garden adjacent to the circular paths. This area was retained mainly for annual crops — those that go through their life cycle, from seed to seed, within a year. Perennials — french sorrel, rhubarb and New Zealand spinach, were established further from the paths. “With only three in the household we did not need many of any particular plant, so we could plant a wide variety of vegetables and herbs. There is no sense in planting more of a crop than you can eat because that takes space which could grow something else, though you should plant enough of the crops that you do eat as a regular part of your diet. Bush beans are a favoutite of mine because they take so little space, can be close-planted and produce a lot of beans. Silverbeet and spinach are our main greens. 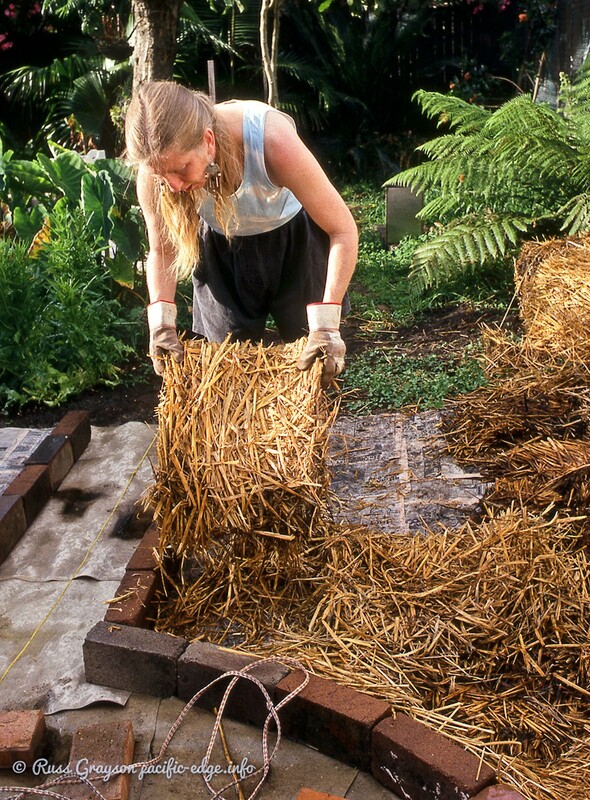 After laying a weed barrier of newspaper, straw mulch was thickly laid on top. “As an experiment I planted a couple slippery cabbage — Hibiscus manihot — a staple leafy green of the tropical Pacific and which I know from our work in the Solomon Islands. In the shadier area between the garden and the back fence two tamarillo (so-called ‘tree tomato’), banana and pawpaw were established. Sweet potato and a small number of the Tahitian spinach variety of taro, given to Fiona by Jude Fanton from the Seed Savers Network and which are grown for their edible leaf rather than for the corm (which does not grow large as in other taro varieties), were planted as an understory. “Bananas do well in this climate. Some cultures cook and eat the long purple banana flower that appears below the ripening bunch, but I have not tried this. Tamarillo yield a succulent, strongly-flavoured red or orange coloured fruit the size of an egg. It is a fast-growing, short-lived small tree whose home is South America. People make it into jam or eat it raw. Most people are familiar with pawpaw and I find it delicious raw or grated into salad while still green. “At the end of the garden adjacent to where the small trees are planted I established a few Jerusalum artichoke, which grow like sunflower as they are in the same family. I also planted Peruvian ground apple or yacon, an edible tuber whose centre of diversity is South America and that is delicious raw, sliced and marinated in lemon juice, grated onto salad or lightly cooked as a vegetable, though I don’t think cooking is its strong point as a food. Yacon or Peruvian ground apple provided a plentiful yield. The edible part is the tuber. Yacon is seen growing behind Fiona. The fence around the garden was planted to climbing beans, other climbing vegetables and passionfruit. The large-leaf plant is taro. The concrete block fence around the garden was used as a trellis for climbing beans and a black passionfruit vine. A strip garden was made along the outer side of the fence and planted to leafy green vegetables of the type that produce leaves that are frequently used, such as lettuce, spinach and chard, rather than the entire plant being harvested at once. Herbs and climbing beans — scarlet runners — were also established there. 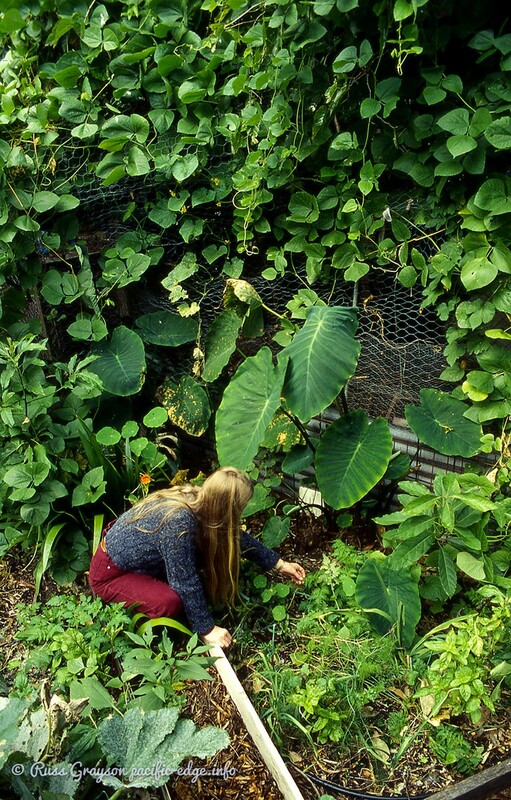 Around the garden’s fenceline a two-metre high trellis was erected for choko, passionfruit, climbing beans and a trial of New Guinea gourd, which failed to thrive. “The frequently used vegetables and herbs are planted close to the path so they are accessible for easy picking”, Fiona said. 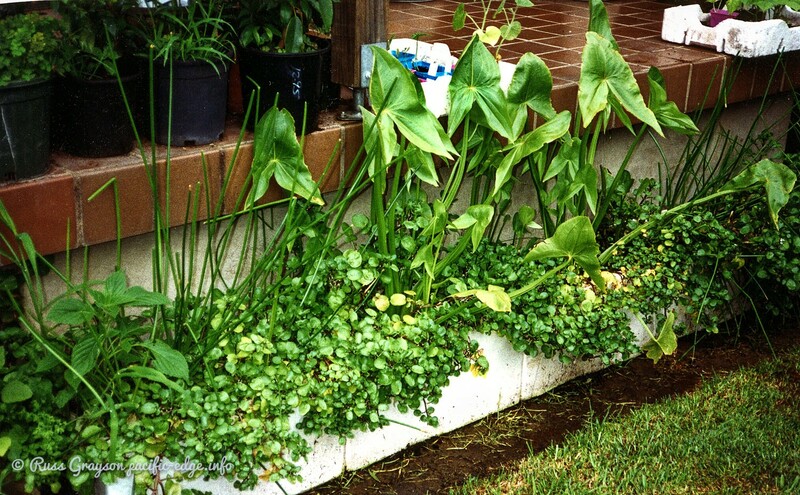 Foam fruit boxes were turned into container gardens for water cress, arrowhead, water dropwort and other water crops and lined along the verandah. A water garden was made in discarded foam vegetable boxes. They were later replaced by a found fibreglass planter. Growing are arrowhead, water chestnut and water dropwort, all edibles. In winter, the rear two-thirds of the garden was left fallow because shading by the neighbour’s oleanders prevented the growing of vegetables. With mulching almost finished and bananas established in the corners of the garden, the water and herb gardens have been planted-out at the centre of the circular beds. The garden alongside the fence was later planted to crops from which individual leaves are plucked and to fruiting crops like small varieties of tomato. The garden, small though it was, provided enough food for evening meals and lunchtime salads. The bananas thrived, producing so much fruit that not all of it could be eaten. The tamarillos yielded sweet, red fruits and the pawpaw yellow fruits of medium size. The yacon and Jerusalum artichoke produced year after year, each time growing back from tubers left in the soil. Some years later, Fiona planned a redesign of the garden to make it safe for her aging mother. “Between working and caring for my mother we now had less time to garden”, Fiona said. “This required a major modification as designing for aged people is quite different to designing for the able-bodied. Designing for the aged… you have to minimise risk. “The curving bark-mulched paths were not suited to an aged person, so we contemplated the reconstruction of the garden into raised, rectangular beds and straight, smooth, paved paths. Designing for households with aged people is different to designing to satisfy your own whims”. At this time, three Isa Brown chickens were acquired as animal therapy for Fiona’s mother. They produced so many eggs that there were plenty to give to neighbours. “The Isa-brown, a French breed so I believe, is bred for its egg-laying productivity”, said Fiona. “We would get six eggs a week from each bird in summer, perhaps one or two less in winter. This was well beyond our needs. They were fed on bought grains and mash supplemented by kitchen scraps and what they foraged in their area of the garden”. “The chooks were installed in a mobile pen consisting of two easily-moved modules that sat on a base plate. We bought it from Rent-a-Chook, a backyard business which rents out chooks so you can try before you buy, if you want to. We fenced around the pen to create a small scratchyard. Every couple months we moved the pen and the chook house to another area of the garden. The chooks ended up following the movement of the sun through the garden, from summer to winter. 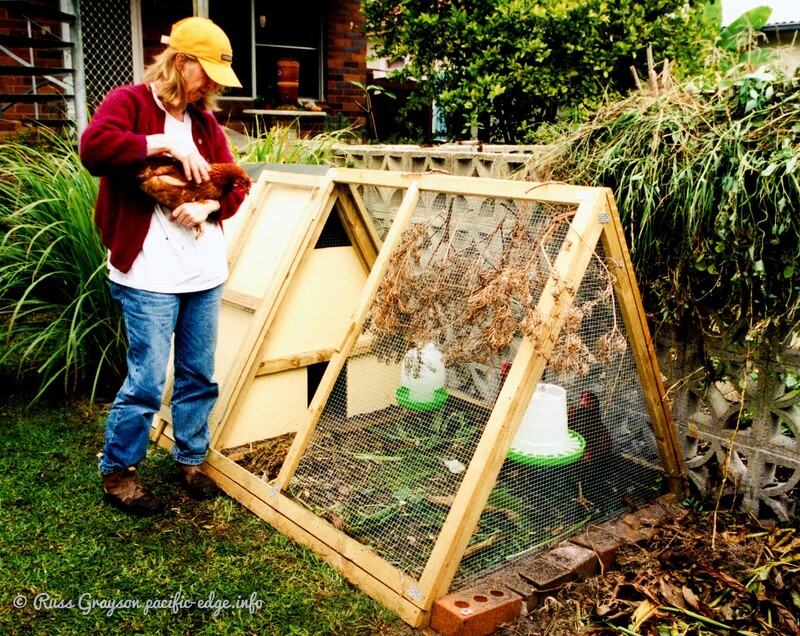 A modular, moveable chook pen was installed where once leafy green annuals and tomatoes grew. The pen was moved around the garden so the birds could scratch-up the soil and fertilise it with their droppings prior to replanting it with vegetables. The branches on the mesh provided shade during summer. “The taro and arrowroot planted earlier provided greenfeed for the chooks, the leaves of which they ate with enthusiasm. They also liked any cabbage-type leaf as well as New Zealand spinach and long grass from the garden. “Greenfeed is important to the health of chooks. Like we humans they need a balanced diet. The Jerusalum artichoke and yacon were still coming up all by themselves so we chopped them up and gave them to the chooks as supplementary feed. “Their diet was made up of bought mixed grains, laying mash soaked in water to make a paste, a little sorghum and sunflower that we grew in the garden — we lost a lot of sunflower to marauding sulphur-crested cockatoos which sweep through this area — vegetable leaf, crop residue, grass and weeds. The chooks virtually eliminated pellitory (asthma weed) from the garden and ate dandelion leaf. Protein came from snails we collected and threw into the pen and the occasional skink they caught, as well as kitchen scraps. Gardening on sandy soils necessitated the continuous production of compost. “We got the lawn maintenance man to leave his grass clippings and leaf sweepings and this made up the bulk of our composting material. As a small, waste-minimising household we didn’t produce enough green waste to make sufficient compost and we didn't have the space to grow crops especially to use for compost. Our kitchen waste and much of the garden waste went straight to the chooks. The garden in production. A pumpkin vine sprawls along the rear fence beyond which is a lemon tree. The pond surrounded by the edible Lebanese cress is seen in foreground. Another learning was about the value of mulched gardens. “Not only does the mulch break down into nutrient for the plants and reduce the growth of weeds, it reduces water loss from the sandy soil. Moisture loss is acute in the dry summer months. It also keeps the soil cool in summer”, Fiona explained. Over the years the soils in the garden changed from porous, nutrient-deprived sand to a darker sand that holds moisture. “This was entirely due to composting and mulching”, Fiona claimed. 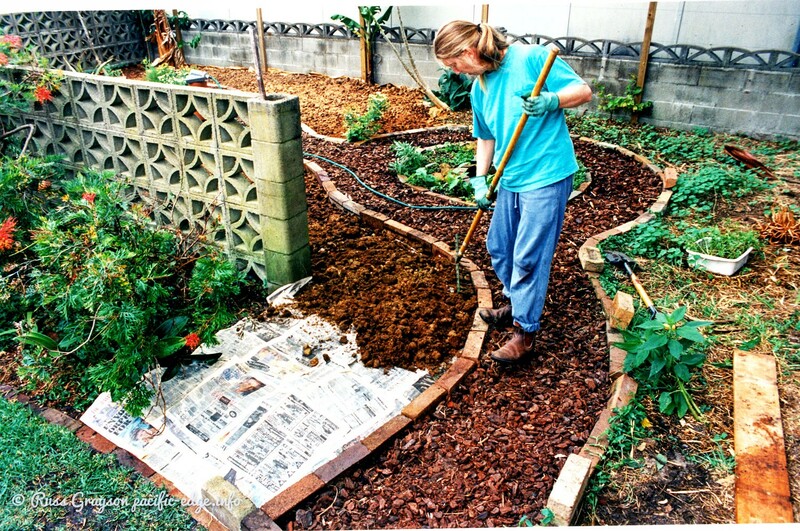 “Mulching also reduces water use in irrigation. With the use of sprinklers being banned in Sydney during our present water shortage and only hand-held hosing allowed in the early morning and evening three days a week, any method that conserves soil moisture is to be encouraged”. Water-holding crystals of a type approved for organic gardening were added to the soil to improve its water retention capacity. The need for careful design has been a critical learning. “When you have the limited space of a small urban garden you have to make best use of it if you are to grow enough vegetables and fruit for your needs. That’s why I made accurate measurements and took the time to draw a base plan to scale. On this, I drew the information discovered during site analysis and the existing structures and features, such as the concrete block fence. Then I toyed with different garden bed designs and the location of paths to come up with a detail plan that would guide the construction of the garden. A detail plan with dimensions marked on it makes it possible to specify materials and quantities. Fiona was after a design suited to the small gardens common in the city. “This is achievable first by looking around to see how other people have approached design, then by taking care with site analysis. After that, it is the turn of the imagination in the design of the garden. Then, soil preparation and close planting. Critical to continued productivity is maintaining the soil in fertile condition”. “I’ve seen urban gardens in which gardeners plant trees which grow too large and occupy too much space. They shade-out vegetables and other plants. Sometimes, they are uncommon species which people eat little of, so planting them in small gardens is a waste of space. “It’s important when designing a home garden to select and space trees according to their mature height and spread. You can use the space between for shorter-lived species until the slower-growing fruit or nut trees reach their mature size. Banana and pawpaw are suitable, shorter-lived species for warm temperate to tropical regions. Fruit trees give us only an annual harvest. Vegetables give us a harvest through the year because we can plant warm and cool season varieties. 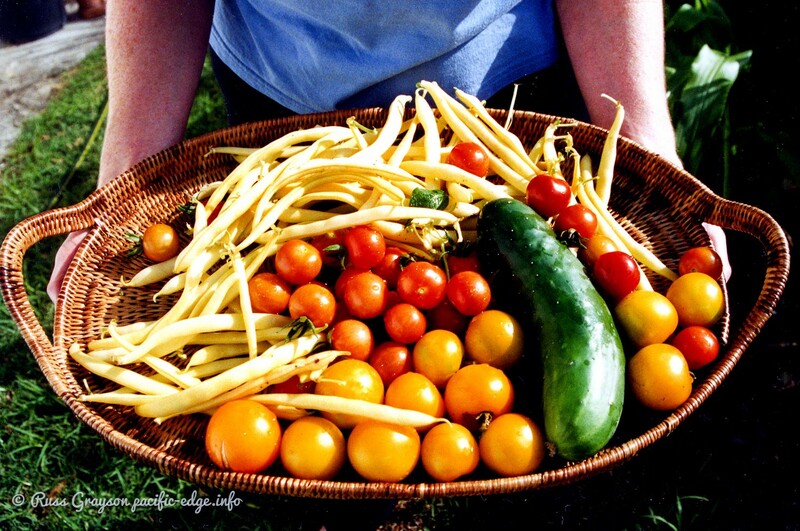 Fiona’s garden proved that a little thought can go a long way when it comes to a productive, healthy garden. Developing a design approach that starts with the needs of the household, passes through site analysis, design and construction and on to maintenance provides a systematic approach to garden design and management that results in a productive garden full of fresh, tasty food. In the years after which this story was first published, Fiona and her partner moved into a shack amid the fruit trees of a garden at Fairlight, close to Manly at the southern end of Sydney’s Northern Beaches. They later moved to an apartment close to Fiona’s workplace where they set up a shared food garden.